The 48G 21700 cell from Samsung is rated for 10A, 4800mAh, and is only for use with devices compatible with 21700 cells. This cell is not intended for high wattage vaping. This 10A, 4800mAh Samsung 48G 21700 Li-ion flat top cell is the newest design in high capacity, high drain batteries from South Korea. The increased dimensions allow for greater battery life and amperage in comparison to smaller cells, increasing safety and usability. NOTE: these 21700 cells have a larger capacity than some others, but also a much lower amperage rating. 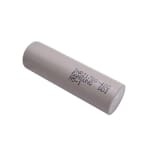 They are intended for low wattage (<35W) long life use, and are not safe for use at high wattages! For higher wattage vaping, use a cell with a higher amperage rating.